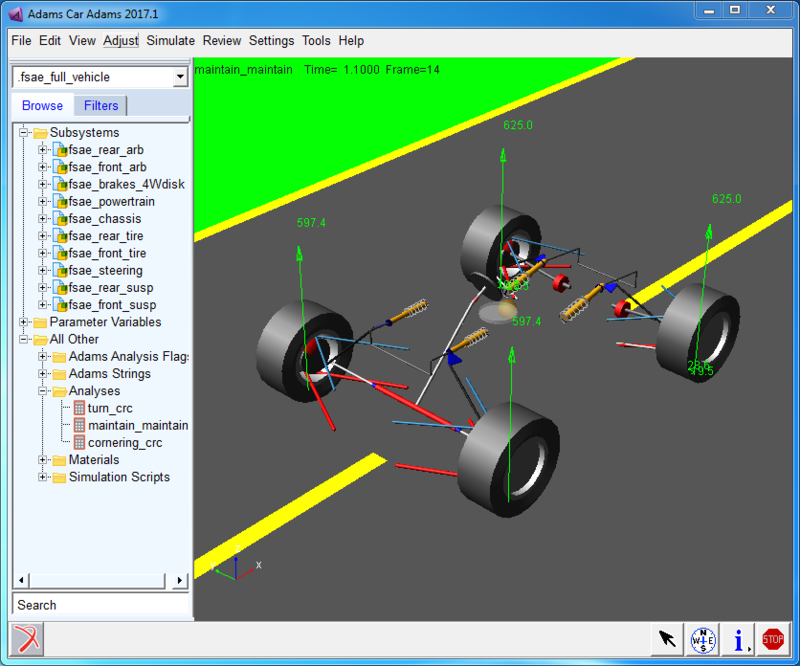 Adams Car software allows students to design and simulate their FSAE vehicles to maximize their vehicle performance. With Adams Car, FSAE teams can quickly build and test their functional virtual prototypes of complete vehicles and vehicle subsystems. FSAE engineering teams can exercise their vehicle designs under various road conditions, performing the same tests they normally run in a test lab or on a test track, but in a fraction of time. Industrial-strength multibody dynamic simulation software available for FREE to university FSAE teams. Solve real-world problems using the same platform utilized by 24 out of the top 25 automobile manufacturers in the world. Reduce development time and costs and improve vehicle performance using software designed specifically for vehicle dynamics and development. Optimize various parameters such as suspension stiffness or location of center of mass to improve overall vehicle performance. Learn Adams Car with tutorials designed specifically for FSAE students. These tutorials include demonstrations, video and voice narration, and step-by-step instructions for simulating your unique vehicle. Also, MSC Software makes its industrial-strength engineering simulation software available for FREE to university student-teams participating in real-world, multi-school competitions.